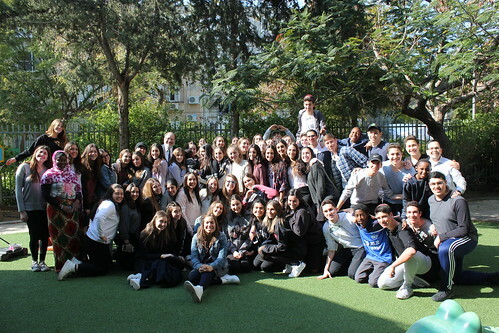 The fifth day of the Chesed Mission was jam-packed with chesed activities. Our first stop of the day was to Save A Child's Heart. Save a Child's Heart is an organization that is based in Holon and provides pediatric heart surgery for children that come from developing countries. Learning more about the organization's efforts in making these treatments available all around the world gave us a better insight into what SACH really does. We were able to meet some of the children that SACH has brought to Israel and through this we developed a deeper connection with the children. We got to put smiles on their faces and those are images that will last in our minds for a life time! We then traveled to the Holon children's Museum where we were able to experience their exhibits "Dialogue in The Dark" led by a sight-impaired guide or "Invitation To Silence," an inter-active exhibition exploring communication led by deaf guides. I explored the "Dialogue in the Dark" exhibit which I found to be very shocking. As we walked through a dark room with our friends listening around for each other we were able to understand what it truly feels like to live as a blind person. This really made a lot of us appreciate so many of the things we take for granted each and every day. Just to be able to wake up and see is something that most people take for granted, but we learned that we should not take these things for granted. We then went to Achuzat Sarah: Emunah Children's Home. Achuzat Sarah takes in children who come from broken homes. We were able to interact with some of the children there one on one, shared a nice dinner together, gave presents to bat/ bar mitzvah boys and girls and danced with all the children. Through this we learned how children can come from such broken homes and still remain so kind and humble through the help of Achuzat Sarah. It was definitely an experience I will never forget! Our final stop was Hemla, a home that saves young Jewish Israeli women who have fallen under the influence of abusive men. The girls of the trip were given an opportunity to go to the Hemla house where they met some of the girls that have been saved. We gave them gifts and danced together, but most importantly we heard stories of a very strong young women and how they overcame the terrible situations they were in. We learned that keeping a strong connection to our Jewish identity is one of the most important aspects of life that will keep a person from making bad decisions.